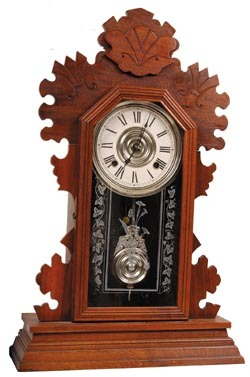 Ansonia Clock Co., walnut kitchen clock, "Beaver", ca 1894. 8 day movement striking a coil gong on the half hours. The walnut case is22-1/2 inches high, clean, original, ready to use. The appealing thing aboutthis clock is the nickel dial center. It matches the nickel dial ring andall nickel pendulum with the fleur de lys addition above the bob. Full label, clock running good. Ly-Ansonia No. 1859.